One of two fashionably Elegant Soaps we made just for the WASR fundraiser (refer to 7 September’s post). A delicate blend of orange and cranberry, this soap has swirls of said colors in cream and is topped with peaks of soap frosting. Accents of sparkling soap orange slices and cranberries put the finishing touch to this endearing homage to the classic dessert. Of course, a little bling in the form of gold mica covered Himalayan sea salt doesn’t hurt either! 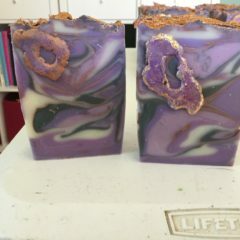 This soap completes our orange cranberry items (bubble scoops and fizzies).